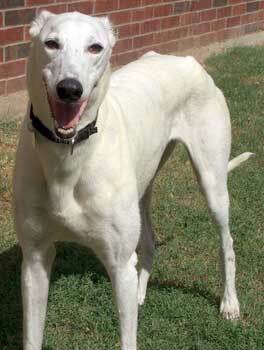 Baby Spice, aka C's Many Spots, is a lovely 6½-year-old white female, born November 19, 2000. Her sire is SKE's Dixiesaint and her dam is Midland Shandice, and she is sister to Ginger Spice, Posh Spice, and Sporty Spice. Baby arrived with her sisters from a brood farm that was going out of business. 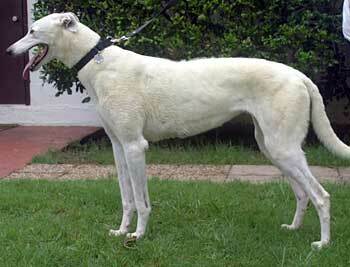 Baby Spice had 5 puppies born November 12, 2004 (3 males and 2 females), and the sire is C's Edgar. Her racing days started August 24, 2002, at Tri State, located at Cross Lanes, WV, moving to Seabrook in New Hampshire, and ended May 22, 2004, at Wheeling Downs in West Virginia. Baby just looked at the cats and trotted on, as if to say, 'I have much more interesting things to do than pay attention to you small, hissing creatures.' When first introduced, her ears went up and her tail wagged and she took a few good sniffs but after that she had other places to smell and things to see. 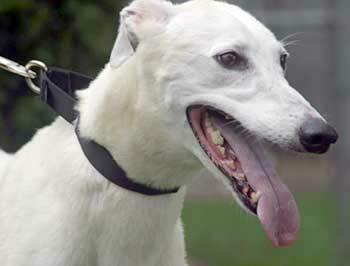 I would say she is cat trainable - as always, use caution when mixing cats and greyhounds. Baby seems a little nervous around small dogs, so she would probably do best in a home with dogs larger than "toy" size. Baby is a very sweet and loving girl. Her name fits her very well and it is easy to call her 'Baby' as a term of affection too! Baby Spice is a regal lady with a small build and a small, fine head and muzzle (which fits perfectly in your hand to easily give her smooches). She still has a fuzzy yellowish coat, but we are working on getting that all brushed out so that her beautiful, smooth white coat will come out. She is very affectionate and loves to be close to her people. Baby loves to be hugged and petted. She is a very smart little girl and learns very quickly. She is not very interested in food and eats slowly. 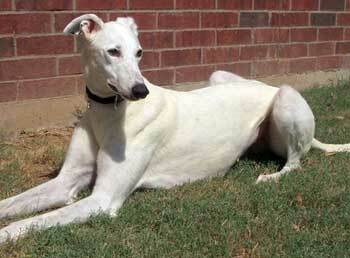 Baby has a happy, calm personality and she likes to be close to people, curling up or 'roaching' on a dog bed. She will follow you from room to room just to be close. She gets along with the other dogs at our house and pretty much ignores the cats. If one of the cats walks toward her - she will turn away, almost like she is a little afraid. Baby will come running when you call her. She does not counter surf or get into anything. She knows to go outside to go potty and is just an all-around dream to have in the house. She does not care to be crated - but we do crate her when we leave the house. Baby walks well on a leash. She likes to play with stuffed toys once in awhile and likes to run in the fenced yard. It only takes a 'No!' to get her to stop doing something that she should not be doing, which is very seldom. She has very good house manners and wants to please. At night she sleeps quietly on a dog bed in the bedroom with her foster brothers and sister. Baby is enjoying retirement, loving those soft dog beds and would love to have her own special forever home and family to love her. I think she would be okay having a fur-brother or sister, but would also be okay as an only dog, too. If you're looking for a very sweet, smart, very well-behaved, little girl - Baby might be just the sweetie for you. 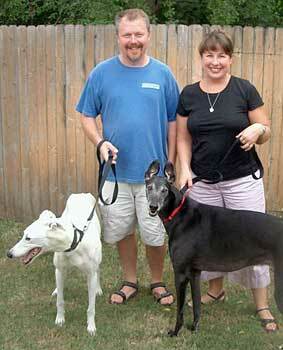 Baby with her new family, including her brother Ray (GALT dog).